1 April - 15 September. For children the main attraction of this site is sure to be the giant, 48 m. water slide. It ends in a separate pool, from which one can slip into the main fun pool and next to that is a paddling pool with a slide for toddlers. Stensager has large pitches on well kept, grassy fields. 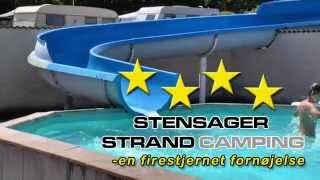 Although Stensager is only a couple of hundred metres from the sea, none of the pitches has views. The rows of pitches are separated by high bushes and many different sorts of trees decorate the site. It is on sloping ground, but the 270 pitches (145 for tourers) are level and all have 6/10A electricity. According to Mrs Gustafsson, the owner, most campers come here to relax on the site or the beach and to visit the historic town of Kolding with its castle, which once belonged to the Danish royal family. This is also a good site for those who like fishing, walking and cycling. Two modern blocks provide washbasins in cabins and controllable hot showers. Children’s section. Family shower rooms. Baby room. En-suite facilities for disabled people. Laundry. Motorhome services. Shop. Swimming pool (18/5-31/8) with giant slide, paddling pool and sauna. Playground. Minigolf. Watersports and boat launching. Daily entertainment programme for children in high season. TV room. WiFi (charged). English is spoken. Follow E45 north towards Kolding and take exit 66 towards Christiansfeld and follow 170 road north. At Taps exit towards Åsturp, Sjølund and Grønninghoved and follow to Binderup, Bjert and Bjert Strand.